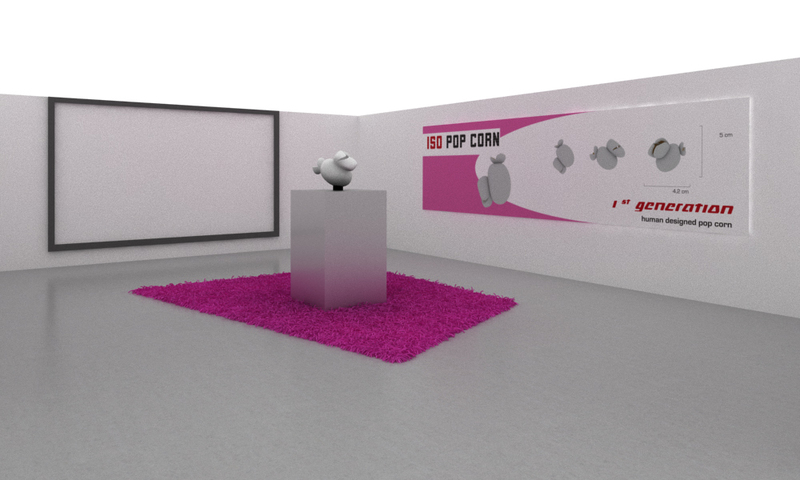 The installation ISO popcorn was presented in 2007 in the form of a ‘show room’ glorifying the absurd invention of a perfect pop corn. sound track enhancing the glorification of the own creation and self celebration /musical arrangement: a musical extract from Vivaldi’s “RV 627: Aria (Larghetto): Resplende, Bella” mixed with a contemporary electro-techno beat. The musical arrangement was done by Sermeq. The art work refers to a recent phenomenon observed in the western society: the introduction of – sometimes absurd – standards and norms into almost all areas of life. The food sector is one example. Fruits and vegetables displayed on the shelves of our supermarkets are identical in size and un-naturally perfect. They look like manufactured goods or simplified illustrations, not like a natural product. But the more we standardize our environment, the more our environment standardizes us. The installation ‘ISO Pop Corn’ was shown in Luxembourg at the group exhibition “070707”. The official exhibition web site was developed by the artist Ren Schroeder: http://www.070707.lu.